A report from a clinical trial for a drug to treat the rapid-aging disorder progeria, published in this week's Journal of the American Medical Association, offers hope for families with the ultra-rare genetic condition. Children with Hutchinson-Gilford Progeria Syndrome have a distinctive appearance, seemingly hurtling towards old age. After an outwardly normal infancy, weight gain slows, hair thins, joints stiffen, and bones weaken. The gums remain smooth, bereft of erupting teeth. Skin wrinkles as the child's chubbiness melts away too quickly, and a cherubic toddler begins to resemble a delicate bird. Beneath the child's toughening skin, blood vessels stiffen with premature atherosclerosis, fat pockets shrink, and connective tissue hardens. Inside cells, chromosome tips – telomeres – whittle down at a frightening rate, marking time too quickly. But some organs remain healthy, and intellect is spared. The end comes, typically during adolescence, usually from heart failure. The rapid aging disorder has puzzled physicians at least since the first case was described in 1886. It occurs in only 1 in 4 million births, affecting one in 20 million people. The Progeria Research Foundation's International Progeria Registry has found 110 living children, and estimates at least 250 others worldwide are undiagnosed. Their work in identifying affected children made the clinical trial possible. 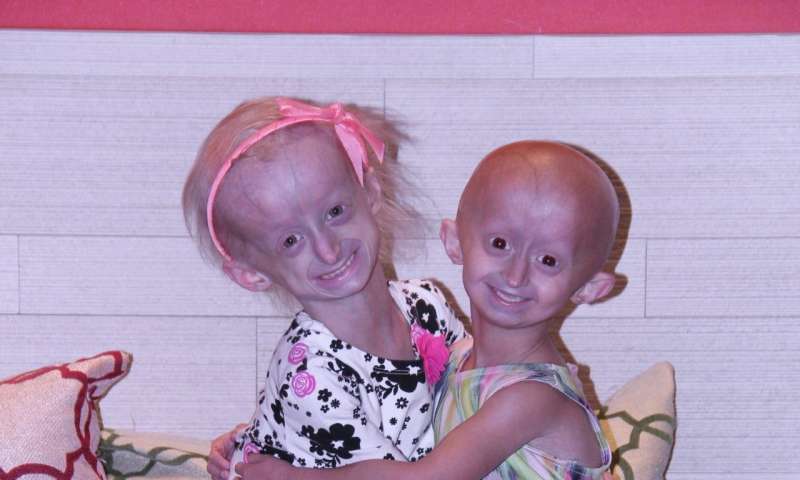 A dominant mutation causes this most serious form of progeria. It arises anew in an affected child. Or, it can affect siblings if a parent has a mosaic gonad and produces some eggs and sperm that have the mutant gene. But progeria isn't passed as an autosomal dominant trait from parent to child, as Huntington's disease is, because people with progeria don't live long enough to have children. Median age at death is 14.6 years. An oversimplified view of a cell. Nuclear pores are actually complex structures built of many types of proteins. The discovery of the gene behind progeria, and realization of how a mutation can contort the membrane surrounding a cell's nucleus, provided the critical clue to researchers that a failed pediatric brain cancer drug, lonafarnib, might slow or arrest the course of the rapid-aging illness. Could it extend survival? The DNA inside a nucleus is only neatly packaged into the familiar X-shaped chromosomes when the cell is on the brink of division. At other times, the 46 chromosomes remain intact, but unwind and rewind around quartets of globular proteins (histones). The precise position of the DNA spooled around the histones, controlled by a fleet of small organic molecules, determines which genes are "expressed" – that is, transcribed into mRNA in the nucleus and the RNA sent out through nuclear pores into the cytoplasm, where yet other molecules translate the mRNA into a protein. The genetic material with all this other stuff – RNAs and proteins – is called chromatin. Of course, the DNA must remain in the nucleus. But which parts of the genome contact the inner face of the nuclear membrane affects which genes are turned on or off. Normally a scaffolding protein, lamin A, places threads of chromatin along the inner face of the nuclear membrane. But for lamin A to adhere DNA threads to the appropriate surfaces, a small organic molecule, farnesyl, must be jettisoned from one end of lamin A. 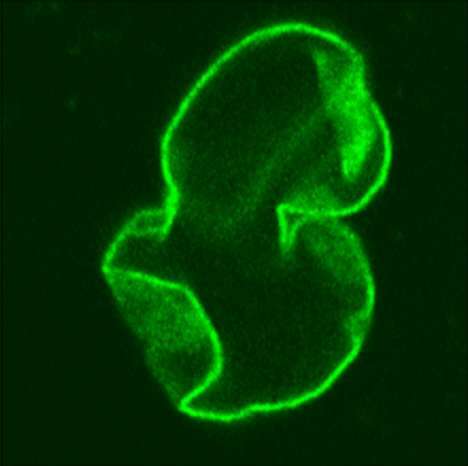 In progeria, a mutation that affects a specific part of the lamin A gene blocks farnesyl removal. The mutation changes only one DNA base, but that alteration creates a splice site, so that a hunk of the gene isn't represented in the mRNA. As a result, farnesyl stays on lamin A. The protein with the extra part is called progerin. The drug lonafarnib blocks the enzyme that puts farnesyl onto lamin A protein. It was developed to block farnesyl transfer in certain pediatric brain tumors, but had been sidelined because it didn't work. The genius of repurposing the drug was in recognizing the connection between the two diseases at the molecular level. We all have progerin; the protein slowly accrues as we age. But in progeria, the accumulation is accelerated. And as progerin builds up, it wrecks the cell, from the inside out. 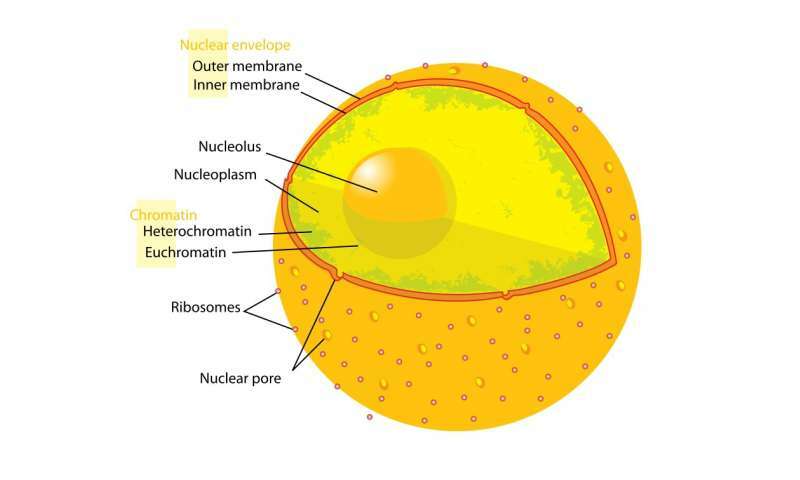 The nucleus undulates and stiffens, affecting the pores that let molecular traffic in and out. DNA replication and RNA transcription go haywire, as the patterns of the molecules clinging to the chromatin change, altering epigenetics. Programmed cell death (apoptosis) hastens. The trademark rapid cellular aging may emerge as abnormal infoldings of the crinkling nuclear membrane touch the telomeres, accelerating their shrinkage. 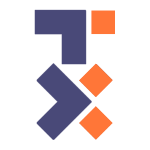 (With each cell division, copies of the DNA sequence TTAGGG are removed.) It's easy to imagine that the chromosomal tips are the most vulnerable parts of chromatin, like the ends of a shoelace dangling from a hoodie. This blog, DNA Science, began in 2012 with two posts about progeria. The first post interviewed NIH Director Dr. Francis Collins about his role in the gene's discovery in 2003, start of the Progeria Research Foundation, and the road to repurposing the drug. The gene discovery was key because the lamin A gene was already well-studied; mutations in different parts of the gene impair health in different ways. The second post described how the drug works and its effects on the cardiovascular system and other symptoms, but not survival. The twice-daily pill stabilized weight loss, thinned arteries and made them more elastic, strengthened bones, and improved hearing. By the time of the third post at DNA Science, in 2014, hints had begun to emerge that the drug may extend life, by on average of 1.6 years. This week's report is more than a hint that the drug affects survival. Although the study is observational – the disease's rarity and ethical issues prevent designing a randomized controlled clinical trial – the findings are clear. Of 63 progeria patients treated with the drug over 2.2 years, 4 died (6.3%). Among 63 untreated controls matched for age, gender, and home continent, 17 died (27%). Children in the untreated group couldn't receive the drug for various practical reasons – distance, or diagnosis after the study had begun. It wasn't denied to set up an experiment. Leslie Gordon, MD, PhD, Medical Director for the Progeria Research Foundation, first author on the JAMA paper, led the team with researchers from Boston Children's Hospital and Brown University. Her son Sam passed away at age 17 in 2014 and brought progeria to the public, most notably in the HBO documentary Life According to Sam. "This study published in JAMA shows evidence that we can begin to put the brakes on the rapid aging process for children with progeria. These results provide new promise and optimism to the progeria community," Dr. Gordon said in a news release. It's wonderful to track progress in treating devastating genetic diseases, especially in children.